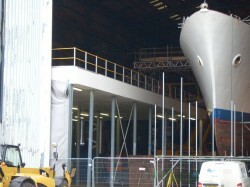 Hampshire Mezzanine Floors designed a very tall mezzanine floor for BAE Systems (formally Vosper Thornycroft) that would enable manufacturing to occur at 9.5 metres with large maritime vessels being worked on below. 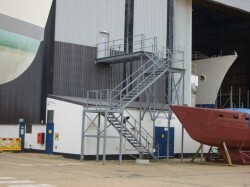 The building at Porchester ship yard had a roof height of over 20 metres and therefore to utilise the dead space within this facility this high specification mezzanine was required. 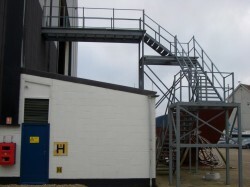 To achieve a means of escape to satisfy building control, HMF designed an external bridge that was fitted above an existing building outside which linked the mezzanine floor to a three storey external grade staircase. Due to the locality of the installation being next to the sea, Hampshire Mezzanine provided this bridge link and three storey external grade staircase in hot dipped galvanised finish which would ensure a long life for this installation without the need for regular maintenance. HMF had to cut a doorway in the side of the building at 11 metres to door head height prior to the bridge link being installed. The mezzanine steelwork and internal three stage staircases were fitted first and then the doorway prepared from the internal side of the new mezzanine structure. Then, HMF brought in a crane to lift the link as a complete structure including the edge protection to both sides and open mesh galvanised flooring into position where the bridge link was then connected into the internal mezzanine steelwork before being weathered. Next, the external door was trimmed with supporting steelwork and new external door and frame fitted by Hampshire Mezzanine Floors. As the mezzanine was a work platform, it was necessary to make the mezzanine one hour fire resisting. Hampshire Mezzanine achieved this with one hour steel column casings, one hour facia to the exposed edges of the mezzanine floor and a one hour suspended ceiling. HMF, as main contractor also carried out all the minor building works, lighting, emergency lighting and fire alarm modifications. This mezzanine floor was one of 11 mezzanine floors built on this site by HMF over a 20 year period. The project was completed on programme and budget.